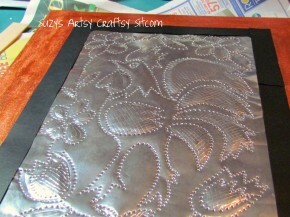 I love the look of punched tin. And of course I wanted to go about it in a totally different way, simply because I’m cheap like that. 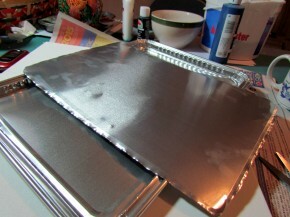 So, rather than pricing out thin sheets of tin for this project, I collected a few aluminum cookie sheets from the Dollar Store. 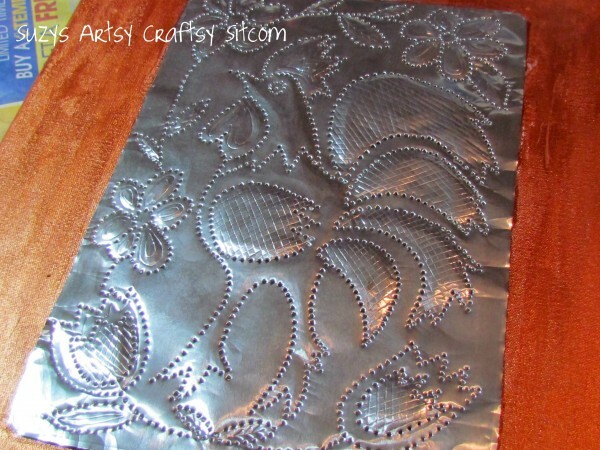 And faux punched tin was born! 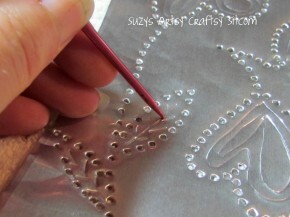 Taking a pair of scissors that you aren’t necessarily attached to (as this will probably dull them), cut the edges of the cookie sheet off, creating one large flat panel. 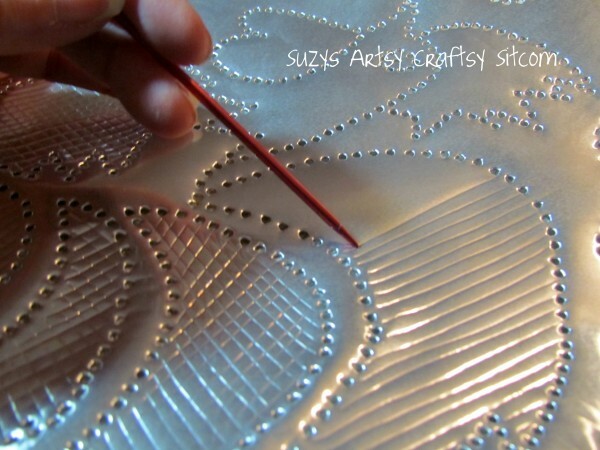 Use your panel to trace the size onto a sheet of paper, and then draw your design out onto the paper. 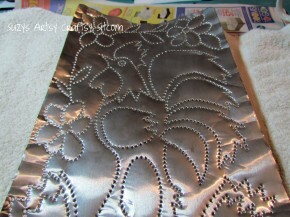 For this project, I chose to do a rooster. Not sure why, although I do seem to have birds on the brain recently with all the goose eggs, duck eggs and ostrich eggs I’ve accumulated to create Ukrainian eggs this year. Anyway, I wanted to fill up the space with lots of detail, so I drew in the rooster and added some leaves and flowers around him. 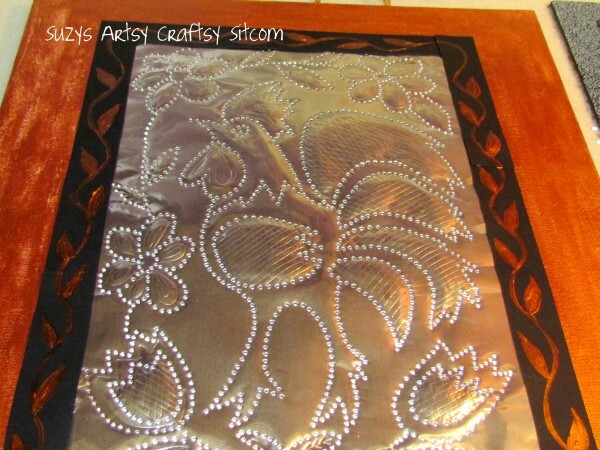 I laid a thick towel out on the table and placed the aluminum on top. 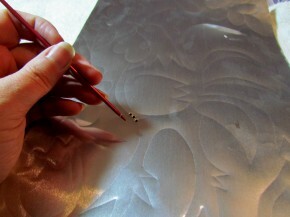 I then placed the drawing over the sheet of aluminum, matching the edges and retraced the drawing, leaving an indent in the aluminum. (Rather than drawing out a design, you could actually use a page from a coloring book at this point, or a printout of some clip art). 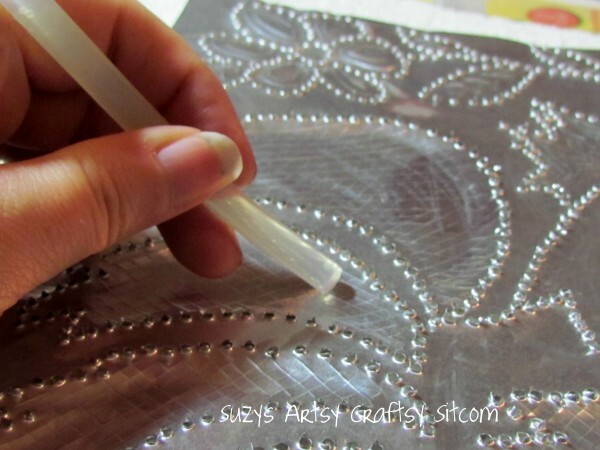 Now that you have your drawing indented into the aluminum, it is simple to just take your knitting needle and punch small holes, following the lines. The thick towel on your table allows you to puncture the aluminum without bending it. Once the entire picture is punched, you could certainly stop here. 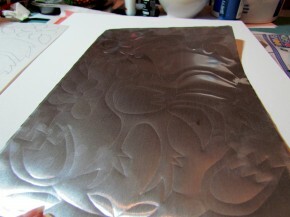 It already looks like an authentic piece of punched tin. But I decided to add some detail. 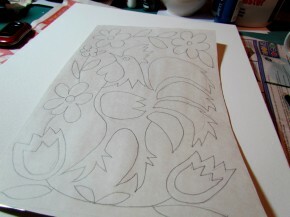 Using my knitting needle, I scored cross-hatching patterns in certain areas that I wanted to bring out the design. 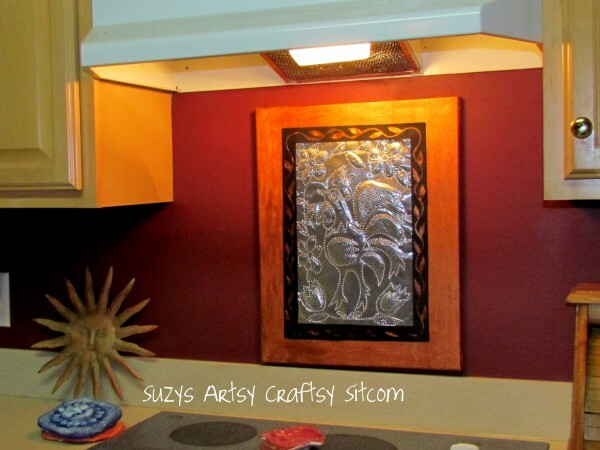 In other areas, I turned the aluminum sheet over and used a stick of hot glue to push the aluminum outward, creating focal points. 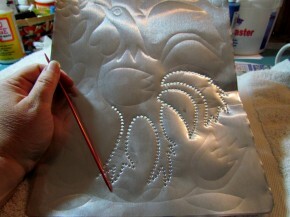 I then laid the aluminum sheet on top of the canvas and traced around the edges. 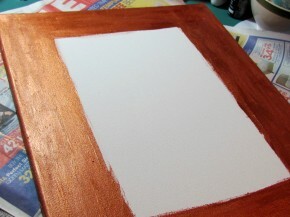 Taking my copper acrylic paint, I painted the edges of the canvas and just past the traced lines. It took two coats of paint to get a good look. 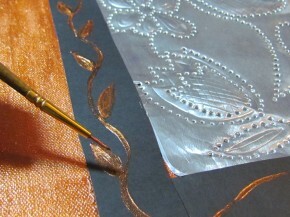 Add hot glue to the canvas along the inside edge of the traced lines and press the aluminum sheet onto the canvas. I then cut 1″ strips of black cardstock and framed it around the edges for contrast, covering the raw edge of the aluminum. I glued the strips down with hot glue. 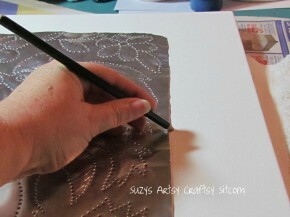 A final touch was to add a bit of leafy-ness to the black frame using the copper acrylic paint. The finished project makes a great focal point for any room. 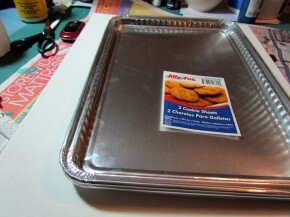 And you are the only one that needs to know that it started out as a dollar store cookie sheet!